Plans were announced last year for a new Studio Movie Grill to open at the old Kmart building at 8501 Auburn Blvd., but the site has largely remained dormant apart from a new CBRE “for lease” sign being added out front. So what’s the latest news? A company spokesperson for the Dallas, Texas-based movie theater chain could not be reached for comment Friday, but a July 18 news release sent out by the company announced plans for the new location to open in summer 2019. The news release said the theater will feature a 49,000-square-feet layout, with 1,300 seats. The news release said Citrus Heights will be the company’s seventh location in California and will feature “a modern, comfortable setting with a dedicated bar-lounge and the very best viewing experience,” along with the chain’s signature in-theater dining. The addition of Studio Movie Grill has been called a “game changer” for the northern end of Auburn Boulevard by Richard Hale, president of the Auburn Boulevard Business Association. He told The Sentinel on Friday he was excited to see the theater coming to the vacant Kmart building, which has been closed since April 2016. Plans submitted to the city show the theater will take up roughly half of the existing 90,000-square-feet building on the left side, with the right-rear of the building to be home to a new 34,000-square-foot Big Lots store. Two other spots, each between 4,500 to 5,000 square feet, will also be carved into the building’s new layout. Although tenants have not been announced for the two smaller spots, a leasing sign posted by CBRE in front of the location indicates the spots are targeted towards retail or restaurant uses. 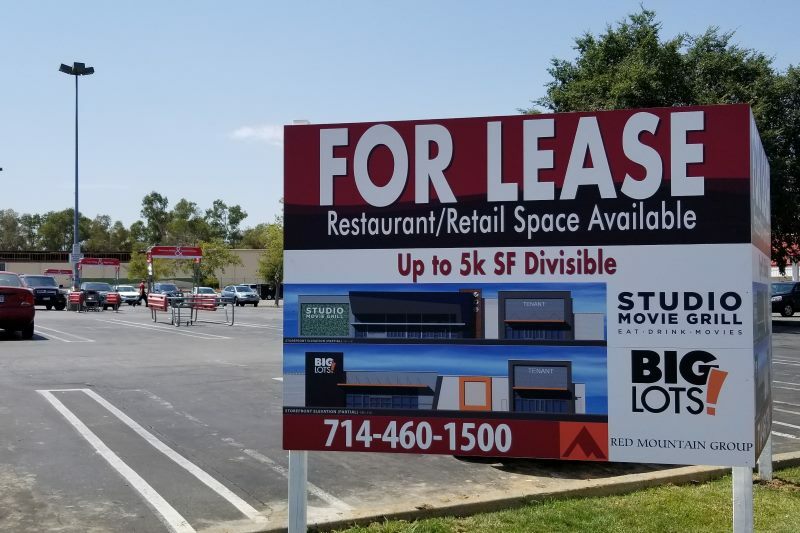 Hale said tenants will likely be in the restaurant category, noting similarities with eateries situated near Studio Movie Grill’s location in Rocklin. Additional revitalization work has also been planned for the northern portion of Auburn Boulevard, extending from Rusch Park to the Roseville border. Known as “Phase II” of the Auburn Boulevard Complete Streets Revitalization Project, the effort is expected to begin construction by 2020 and will likely include similar upgrades as the first phase, which was completed in 2014. That phase extended along the boulevard from Sylvan Corners to Rusch Park and included undergrounding utility wires, adding new street lights, planting over 200 street trees, and installing nearly 10,000 feet of bike lanes and sidewalks. Other changes could include a new gateway arch and traffic signal that has been proposed on the boulevard in front of the old Kmart building. Got a question about something related to Citrus Heights you’ve always wanted an answer for? Click here to submit a question for consideration in a future Q&A article. Q&A: What’s happening with the roadwork on Sunrise Blvd? Q&A: Why wasn’t Pet-a-Palooza held in Citrus Heights this year? Q&A: Why do police leave bodies on the road after a traffic fatality?